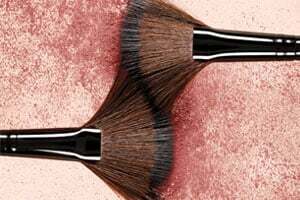 • Before applying powder blush, always set skin first with Translucent Powder for the most even and smooth application. • Pick up product with Cheek Colour Brush or Angled Cheek Contour Brush. • Distribute the color on the back of your hand to distribute pigment evenly through bristles. • Apply to apples of cheeks in soft sweeping circular motion and blend for an even and sheer application. • For a bold look, release more blush color by gently tapping the bristles on the cheeks, or re-prep the brush and repeat application. • Focus on the center of the apple and build the color to the intensity you desire. Talc, Dimethicone, Nylon-12, Zinc Stearate, Silica, Magnesium Myristate, Cetyl Dimethicone, Sodium Hyaluronate, Lauroyl Lysine, Hexylene Glycol, Phenoxyethanol, Caprylyl Glycol. May Contain/Peut Contenir/(+/-): Mica, Titanium Dioxide (Ci 77891), Iron Oxides (Ci 77491), Iron Oxides (Ci 77499), Red 7 (Ci 15850). Ingredients Talc, Dimethicone, Nylon-12, Zinc Stearate, Silica, Magnesium Myristate, Cetyl Dimethicone, Sodium Hyaluronate, Lauroyl Lysine, Hexylene Glycol, Phenoxyethanol, Caprylyl Glycol. May Contain/Peut Contenir/(+/-): Mica, Titanium Dioxide (Ci 77891), Iron Oxides (Ci 77491), Iron Oxides (Ci 77499), Red 7 (Ci 15850).